The OmniCure® Platform of UV/Visible Spot Curing Systems and related accessories are the key elements of this Group. Serving customers in over 70 countries we have become recognized as the global leader in light-based spot-curing with precision assembly expertise. The OmniCure® Platform of products are leading edge spot-curing systems, that deliver stronger, faster cures than traditional assembly methods. This results in improved quality, faster production and reduced manufacturing costs. The OmniCure® technology also offers unmatched control, allowing users levels of customization and precision making these systems the most advanced of their kind worldwide. Two years ago we decided that we would strategically expand our business into new but related markets that are connected to our core competency of understanding light and its relationship to chemical photoreactions. This resulted in market research initiatives in several markets. Based on a comprehensive portfolio review process we determined that there are specific niches within the graphics printing market that we believe we can succeed in. As a result, we created the Excelerate product family that targets the graphics printing market. To ensure our success in this market, we have developed a separate and dedicated internal sales and marketing team, and separate OEM sales channel partners. We have chosen a direct OEM sales channel model based on the current profile of the market which typically includes a 1 to 2 year sales cycle, configurable and customized products, direct service and sales support, and most importantly it is what customers demand and expect. All of the companies we will be dealing with are OEM integrators. To meet the demand for instrumentation critical to life science research, we offer a unique line of piezoelectric-based positioning systems and high-performance mounting solutions for use with microscopes and manipulator assemblies. For more than twenty-five years, Burleigh® precision piezoelectric technology has enabled groundbreaking biological research in cellular manipulation, electrophysiology and in vitro fertilization. Engineered to the specifications of imaging specialists, this supplies the microscopy illumination market with high-powered light sources that offer unparalleled performance for fluorescence cellular imaging. compatible third party options including Shutters, control software, etc. 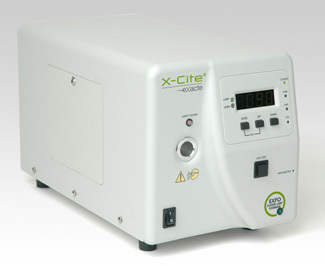 Right: X-Cite exacte Fluorescence Illuminator, introduced March 2008. Contact Company Seven for additional information about these exciting products.